Are you looking to raise chickens this spring? Pasturas Los Alazanes will have a great selection of baby chicks in our store starting on March 21, 2015. All of the chicks that we offer at our store are pullets, including Rhode Island Reds, Barred Rocks, Americanas, and White Leghorns. In addition to baby chicks that we offer, we also carry all of the products you need to raise your chicks. We carry feeders, waterers, heating lamps, and much more. Our expert staff will be happy to help you get started with everything you need for raising chicks. Come on by and see us today. Here at Pasturas Los Alazanes, we are committed to making sure you have exactly what you are looking for. 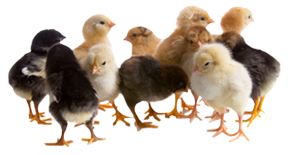 If you have any questions about the baby chicks and chicken supplies that we offer, then please click here to visit our contact page. We will be more than happy to answer any questions you may have.